Dr. Weyrich, President/Founder of EyeCare WeCare Foundation received the Melvin Jones Fellowship - one of the highest honor bestowed upon an individual club member. It was presented by The Aberdeen Washington Lions Club president Pat Anderson during the yearly instillation of officers dinner on May 23, 2011. The other award is the 3rd highest award bestowed upon a club member. The International Presidents "Letter of Commendation" He received this award at the MD 19-G Lions District Spring Conference in Kelso, Washington on May 21, 2011 by District Governor Terry Sutfin. He received both of these awards because of his humanitarian efforts with the medical vision missions that he has conducted in third world countries. He feels that these awards are not for personal accomplishments, but rather it brings attention to the efforts of the foundation. Aberdeen presented Lion Jim with a Melvin Jones at their Charter Party. Past District Governor Terry Sutfin was there as well to present Lion Jim with a Letter of Commendation from International President, Sid Scruggs III, for his EyeCare WeCare missionary work in the Philippines. Lion Jim is what I call ultra-active. He and his wife Ellen’s tireless effort of doing two missionary trips annually requires a tremendous amount of effort and dedication. Picture and article from "Zoning In" news letter by MD 19G-3 Zone Chairman Norm Adams. ﻿Dr. James Weyrich Awarded the "Ambassador for Peace Award"
​Dr James Weyrich President /Founder of EyeCare WeCare Foundation Receives the Ambassador for Peace Award. 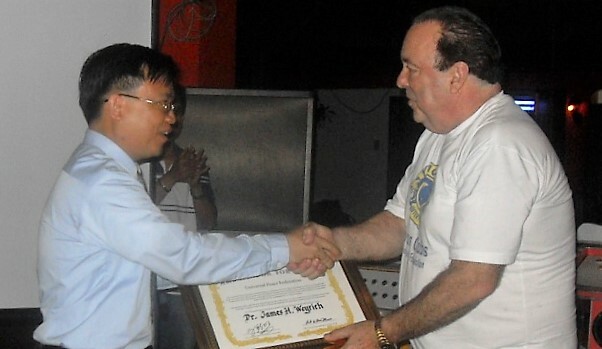 He received the award on January 24, 2011, after the completion of the January 2011 Medical Vision Mission in the Municipality of Umingan, Province of Pangasinan, Philippines. The award was presented by the Philippine Director of Asian Mobile Medical Services, Philippines. Dr Primitivo Chua, Philippine Medical Association. The Universal Peace Federation and the Inter-religious and International Federation for World Peace acknowledge as Ambassadors for Peace those individuals whose lives exemplify the ideal of living for the sake of others, and who dedicate themselves to practices which promote universal moral values, strong family life, inter-religious cooperation, international harmony, renewal of the United Nations, a responsible public media, and the establishment of a culture of peace. Transcending racial, national and religious barriers, the Ambassadors for Peace contribute to the fulfillment of the hope of all ages, a unified world of peace wherein the spiritual and material dimensions of life are harmonized. The Universal Peace Federation and the Inter-religious and International Federation for World Peace are proud to hereby recognize as an Ambassador for Peace. Remarks from Dr. Weyrich after receiving the award. "I was blown away when I received this award. I do not know who nominated me, but this award does not belong to me. it belongs to the many dedicated volunteers and sponsoring organizations that make every medical vision mission a reality. I am just the director, the choir deserves this award. I am but a servant of GOD and he is the ultimate Ambassador of Peace." The Daily World Sunday Edition April 14, 2013 "Across the Seas to help them See"